I'll be starting a fresh Adgitize payment series for this year so this post serves to kick things off; aptly named Payment 1. I did not receive email notification for last month's earning so I was unaware that I was already paid on the 7th. As always Adgitize paid on time and when I checked my PayPal today, I was happy to see my earnings safe and sound inside my account. Due to server problems, January was a pretty chaotic month for Adgitize; members found ourselves having issues with missing article points, inability to record click points and basically logging into our accounts. However the good people at Adgitize have already taken steps to rectify the issues mentioned and points have been restored and earnings updated. My payment for Jan 2010 is further proof that Adgitize Works and Adgitize Pays so what are you still waiting for? Become part of a network of publishers and advertisers who are enjoying both increased traffic and a little side income for Blog Page Views, Adgitize Ad Views, Writing Articles and Visiting other Member Blogs. Don't miss out on the hottest blog advertising network today and get your monthly ad in the system for only US$14 with just one click! yalor so jam so many ppl so hot omg almost pengsan there!!! If tak menjadi the hair, sure tensi right after all that sitting? Grrrr…..
Congratulations to your earnings Mariuca! I was very lazy in January :) because ad was paid by Adgitize, so didn't matter that i just break even. And i think i got more fake clicks as my points never reached anymore 470 only between 430 - 450.
wah banyak tu.. congrats dearie!! I've been with adgitize for quite sometime now and have no idea at all how it works ... LOL! Congrats on your adgi payment :D How much more do you need to collect before you can buy me my Kancil, ah? LOL! 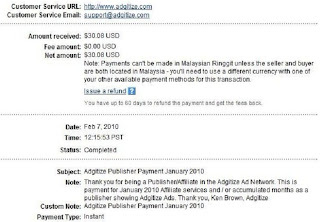 I'm with Adgitize thanks to your recommendation but never really bother to try to earn money with me! maybe too much work and I'm too busy! So how often you get paid? I mean earn money with it. Haha. Congrats! Always a good earning. True, it was a chaotic month. Funny thing is during the server-down days the earnings were actually higher than average. I even got $1.1 on one of those days. You´re doing very well with Adgitize! So far, I only received one payment from them. Thanks for visiting, advertising in my blogs and your support. THanks Ayie, how are u doing with Adgi? I love Adgi Mize and will continue advertising with them! Maybe u can try placing an ad too… hugs! Ha ha!! Thanks sweetie, guess I’ll take that as a compliment! Sape nak mintak benda free Bem?? Terima kasih GG and syabas to u too then! LOL hi Hitesh! Not so big, just a reasonable amount he he thanks! !